Peripheral makers have been hyper focused on things like mechanical keyboard, gaming mice, and headsets, but where's the love for gaming chairs? It's not a very crowded field, comparatively speaking, but it just got a little bigger with the introduction of Vertagear's Triigger 275, 350, and 350SE. 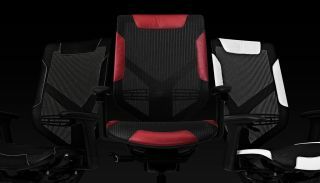 The Triigger chairs kick off a new Gaming Series by Vertagear, though they're not the first chairs Vertagear has built for gamers. We sat our bottoms in the company's SL4000 earlier this year and found that it was well made. We also have one of the new Triigger chairs in-house and find that it's really comfortable (stay tuned for a full review). All three new models feature a dual spring hub that evenly distributes the pressure being applied to the chair. The difference between them is in the number of components used and color. Vertagear uses over 275 components in the Triigger 275, which is available in black, blue, red, and white, and over 350 in the Triigger 350 (black) and 350SE (special edition red). Inspired by Formula One racing cars, the chairs use paddle shifting triggers to adjust the lumbar support and height. High end materials are used throughout. The chairs are made from an aluminum alloy frame and contain class 12.9 screws, real calfskin leather, Holtron hub-less casters, and reinforced DuPont TPEE mesh. The level of luxury here doesn't come cheap. Suggested pricing has been set at $600 for the Triigger 275, $800 for the Triigger 350, and $900 for the Triigger 350SE. All three should be available to purchase in December.